1. Open the talk at SuperLectures.com and switch to the share tab. Then copy the <iframe> code. 2. Paste the code into your post (in HTML mode). If needed, modify the size of the player by setting the height and width parameters. We have a few interesting numbers from the first 24 hours of the published videos from Barcamp Brno 2012. So, congratulations to all speakers on nice presentations and all visitors who attended Barcamp in person or watched online. We published the video recordings on Monday noon, July 2nd 2012. 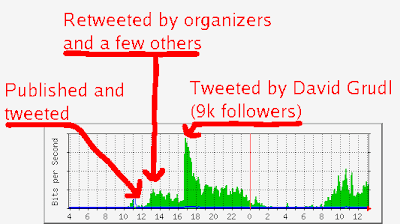 The information spread within 1 hour through Twitter and we were waiting to David Grudl with his closely 9 thousand followers to tweet that his talk had been published :). David, thanks for a nice traffic peak. Several more stats during the first 24 hours.. There were closely 1800 unique visitors (Google Analytics) and 2000 unique IPs. There were 2 millions seconds of video replayed (it is 555 hours). Only 28 hours of videos were published by the way. Barcampers are everywhere (Google Analytics geolocation statistics). And finally, here are the top 20 most viewed lectures. Hello, we have finished processing of 40 lecture video recordings taken during Barcamp Brno 2012. They all are in Czech.